Indeed it was through the power of intercession of Isaac for his wife Rebekah that she became pregnant. Abraham experienced the power of prayer; that was why his servant knew the power of prayers and prayed in the last chapter. Isaac knew and practiced the power of prayer as an intercessor for his wife. I am very sure he learned it from his father and even the servants! We really need to know the power of intercessions and to be a faithful intercessor to pray as often as we can. Michelle's doctor-in-chief said he had never seen a leukemia patient be that good before. I know that it is because of prayers. Many, many intercessors have been praying for us including you! Thank you and thank you!!! I have heard all kind of method for our dear brothers and sisters to pray for Michelle and they are so wonderful. May I share with you one of those many ways of prayers from Glenn who is a parishioner from Rev. Ed Hird's church. It is such a powerful and moving example of how people prayed for Michelle! Thank you Glenn! During our time together I mentioned to Silas that after hearing about Michelle’s diagnosis myself and a dear sister in Christ went to Vancouver General Hospital to blow the shofar and pray for Michelle and Silas and their family. Silas became very interested in what I was saying. After asking several questions He declared I must write what I was saying on his blog and that I must do it right away. So here I am writing my first ever blog entry. Given that it is my first blog I ask you to please forgive me if my written entry has flaws in it like me. It is 8 am Sunday morning and I am halfway up Cypress Mountain looking out over the city. I can see Stanley Park, English Bay, UBC, Vancouver, and the outline of Richmond in the distance. This morning the rain is falling gently like living water washing our city clean. May the Lord reign in our cities. May the hearts of the people be turned over to Him. May the people of our cities say yes and amen to Him and accept Jesus Christ as their Lord and Saviour. The Toby Mac song City on Our Knees plays on 106.5 FM. The song and words seem appropriate for the time. One through Him who loves us more than we can love each other. Part of being a city on our knees is prayer. Dear Lord I pray that the meditations of our hearts and the thoughts of our minds would be of You That whatever is written here comes from You and is for Your glory and that anything that is not of You we will all be closed to and it will fall to the wayside and be burned up. The point of this blog entry is prayer. Silas has told me that the prayers for Michelle, himself, and his family are much appreciated and I encourage all to continue to pray for Silas, Michelle and their family. It is good, and right, and in alignment with the Word of God for us to do so. However, I do not believe Silas wanted me to write this entry because it was about prayer for him and his family. I believe the Lord has given Silas a deep heart of love for others and out of that heart of love he wanted me to write this blog as an encouragement for us all to pray for others. Silas, Michelle, and their family just happen to be a focal point or catalyst for the prayer that has led to this writing. We are commanded to love the Lord our God with all our hearts, all our souls, and all our minds and to love our neighbours as ourselves. One of the ways that we can demonstrate that love is through prayer. Our Lord Jesus Christ, Yeshua Hamashiach, who lived, died, and was resurrected teaches us to pray. The Bible teaches us that Christ prayed to the Father in heaven and that with compassion and out love He prayed for the protection and healing of the people. We too can follow the example set by Jesus and pray to the Father in heaven to seek loving communion with Him and with the love of Christ in our hearts we can pray for our neighbours, for their protection, healing, and that blessing would come upon them. As soon as I became aware of Michelle’s diagnosis the Lord put it on my heart to pray and blow the shofar for Michelle, Silas, and their family and as part of praying for them I was to go to the hospital and pray from there. I called a prayer partner who had been to VGH with me before to pray for someone else who had cancer. She immediately, with joy and thanksgiving in her heart, agreed to come with me to VGH to pray and a time was set for the following week. When we arrived at VGH we first prayed and blew the shofar in the direction of the hospital from where we had parked the car; it was a few blocks away. I believe these prayers and the sounding of the shofar brought the light of the Lord and a covering for us as we entered into this time of prayer. We walked towards the hospital and came upon a street that was lined on both sides with gorgeous pink blossoming cherry trees. We were covered by a canopy of the Lord’s beauty as we walked through them. A glimpse of heaven are words that come to mind. Our spirits soared and we rejoiced and gave thanks to the Lord for who He is and all that He provides. We arrived at the hospital on the centre south side of the complex and prayed and blew the shofar before entering in. Just inside the entry, to the left, is the Chapel room which is named the Sacred Place. I believe all hospitals have a room like this and I encourage everyone to go and pray in these rooms from time to time to provide Godly covering for the patients and staff of the hospitals. Once in the room we removed our shoes and entered into a time of prayer. We focused our prayer on Michelle’s healing as well as strength for Silas, Michelle, and there family. While praying the Lord brought songs, praise, scriptures, and deep prayers to our hearts. One of the songs the Lord gave us was “We are standing in His presence on Holy ground.” At that time we were alone in the room allowing us the freedom to sing, cry out, read scripture out loud, and even sound the shofar at a medium volume. We were praising the Lord when a man who follows a muslim belief came into pray. I was reading scripture aloud at the time and out of consideration I asked him if that would be disruptive to him. He said no and we were provided the opportunity to continue reading scriptures, praise the Lord, and pray while he was there. Halleluiah. After the muslim gentleman left we felt led to pray the light of the Lord everywhere in the room, which we did. As part of filling the room with the light of His love we sounded the shofar again. The song “Where the Spirit of the Lord is there is freedom” came to us. We were filled with joy. Next a group of lay workers came in to prepare for a Catholic service that was scheduled for that afternoon. They were drawn to the sound of the shofar and we were able to have a good time of prayer and discussion while they were setting up. Praise the Lord. At that point it was time to leave the Chapel. When we did the Lord prompted our hearts to go around VGH to pray and blow the shofar at the four corners of the VGH complex. However, when we went outside and started to walk east to the first corner it became clear that the Lord wanted us to pray and blow the shofar in more places than just the four corners. At the first location we felt a leading to stop at looked directly at the cancer clinic. I believe that is where Michelle would have been. The Lord provided a time of deep focused prayer and blowing the shofar for Michelle, Silas, and their family, lifting them up to the Lord. We rejoiced and gave thanks for this time of prayer the Lord had given us for them. Moving on from there we spiritually prompted to stop at an archway that opened to a path that led to a stairway to a separate building. While praying and blowing the shofar a woman came out and sat on the stairs and we were able to witness to her and pray for her. Thank you Lord; praise your Holy Name. From there we went to the southeast corner and continued to pray and blow the shofar. Lifting up Silas and Michelle, their family, the other patients, the doctors, and the staff to the Lord and praying the light of His love into their lives and His Spiritual covering over them. And so it went around the VGH complex. Wherever we felt led we stopped and prayed and sounded the shofar. Whether it was the doctors residence, the cancer clinic, the emergency room, the arthritis centre, the area for treatment of the brain, or the centre for treatment of skin disease, we just prayed as we felt the leading of the Lord. People were drawn as they were walking or driving by. Some stopped and wanted to know more and we were able to plant seeds and bless them. Others made encouraging comments or waved as they walked or drove by. We were able to pray covering and blessing upon them as well. What Michelle and Silas and their family are facing is serious and cries out for committed fervent prayer. What the Lord showed us when we went to VGH to pray was l’chaim, life. We experienced it in prayer as the Lord led us to pray joyously for life for Michelle and the other patients at VGH. Life that first comes with a saving grace relationship with the Lord Jesus Christ. 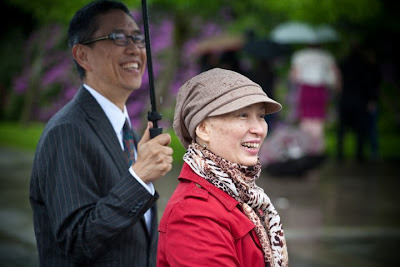 We experienced it in the cherry blossoms as the Lord brought a touch of heaven to our hearts as we walked to and from VGH. We experienced it in the interaction with others and the opportunity to speak to them about the Lord or pass blessing onto them by praying over them as they went by. We came to help stand in the gap for a dear brother and sister and their family and the Lord blessed us with life. I feel led to say Michelle, Silas and family the Lord has a trial to be set before you in your life. However, you must know that this trial that you are in has blessed the lives of others. Peoples’ lives have been prayed for and seeds of eternal life have been planted as a result of it. This has been made possible by the decisions you have made and the path you have chosen to walk. Bless you God’s peace, know that you are loved. Thank you for giving us an opportunity to experience the power of intercessions through suffering. Help more brothers and sisters to be a faithful intercessors for your Kingdom's sake. In Jesus name I pray. Amen. DAY 284 - He Knew How to Pray, do you? Abraham's servant knew how to pray! 1. Pray before the beginning of a task (v. 12): His prayer was answered before he had finished praying! 3. Give thanks after the success (v. 48) and know that only God can lead you on the right road. He was not a famous leader but a nameless somebody and he knew the power of prayers. He prayed and prayed and prayed. Quite a number of people pray when they are facing with a "mission impossible" like Abraham's servant. Only a few know how to give thanks to see some good signs. Even fewer remember to give thanks when the prayers are being granted. How well do you know the power of prayers and how well do you pray? Pour down your fresh anointing that I can be able to teach more people to pray. In Jesus name I pray. Amen. DAY 283 - Had Abraham Prepared for This? DAY 282 - What Have You Withheld from God? DAY 278 - Not Even 10! DAY 276 - Can You See The One Who Sees You? DAY 273 - Life Is A Circle Game? DAY 270 - Is Your Name There? DAY 267 - Who Will Be Wiped Out? DAY 264 - How Can You Master A Crouching Tiger? DAY 262 - What Do You Breathe Daily? DAY 261 - God Said What? DAY 260 - Amen. Come, Lord Jesus. DAY 255 - Who's The Woman And Who's The Beast?